It is important to chill your ice cream base completely before adding it to your ice cream maker. This will generally take 2-4 hours for american-style bases that don't require heating and overnight for custard bases that were heated. You can always speed up the process by placing the ice cream base in an ice water bath but you will benefit from aging if you do it overnight. While chilling does take extra time, it will help minimize the formation of large ice crystals. Depending on the brand of ice cream maker, removable bowls can take up to 24 hours to freeze properly. Since this can be a major hindrance to impromptu ice cream parties, it is generally a good idea to store the ice cream bowl directly in the freezer. This way you are ready to make ice cream whenever the feeling comes over you! A good rule of thumb is to only fill your ice cream maker 1/2 to 2/3 full. This generally leads to the best results. It is important not to fill the ice cream bowl completely because this will not allow for proper aeration of your ice cream while it is mixing. Egg yolks are comprised of high levels of fat and protein, which freezes differently from water. This means that adding them to your ice cream will make it soft and creamy. In addition to adding creaminess, egg yolks help make ice cream more stable, meaning that it will melt less quickly. To reduce the egg flavor in custard ice creams, do not overheat the ice cream base. The more you heat it, the stronger the egg flavor will be. If cooking the base in the traditional method, you need to heat it to at least 85 °C (185 °F) to pasteurize the eggs. But you can also do this sous vide at a much lower temperature and cooking it for a longer time. Cook the egg custard at 69 °C (156 °F) for 20 minutes to pasteurize them and minimize the egg flavor. What causes the strong egg flavor when cooking them at 85 °C (185 °F)? As Heston Blumenthal explains, at this temperature, the proteins in the egg have coagulated and have begun to denature, meaning that they have started to coil up and bind together making the custard thicker. These concentrated clumps of egg protein generate encapsulated bursts of flavor. Cooking the eggs at 69 °C (156 °F), below the coagulation temperature of 72 °C (162 °F), produces a thick enough custard with a reduced egg flavor. The freezing process reduces the sweetness of the fruit so it will taste less sweet than the sorbet mixture before freezing. Use fruit that is ripe and sweet or compensate by adding sugar. If the fruit is very ripe or sweet, reduce the amount of sugar in the recipe. Flavoring solids (inclusions in the form of pieces) such as nuts, candies, cookies, dried fruits, etc. should be frozen before incorporating them into the ice cream during the churning step to reduce the formation of large ice crystals and to prevent the ingredients from becoming soggy. Adding nuts to ice cream usually creates two problems. Due to their high levels of unstable fat they become rancid easily and the moisture from the ice cream can make nuts lose their crunch. Oil roasting the nuts or by using an actual coating like chocolate or praline will create a protective barrier and extend their quality in the ice cream. When including pieces of cake, cookies or brownie, it is better if they are low in moisture and relatively hard. Once incorporated into the ice cream, moisture will migrate into the pieces and change their texture to have the more familiar characteristics. Oreo cookies work well in ice cream without being modified. Sauces and syrups (inclusions in the form of variegates) should be refrigerated and incorporated at approximately 4.4 °C (40° F). These are flavoring liquids that are folded right after churning and before hardening and appear as ribbons in the final product. Incorporation at a higher temperature will create ice crystals around the variegate. As with any type of cooking, it is important to use the best ingredients possible in order to obtain maximum results. With ice cream make sure you use good quality fruits and other add in ingredients for optimal flavor. Freezing ice cream quickly will help ensure it is creamy and smooth, because it prevents the formation of ice crystals. 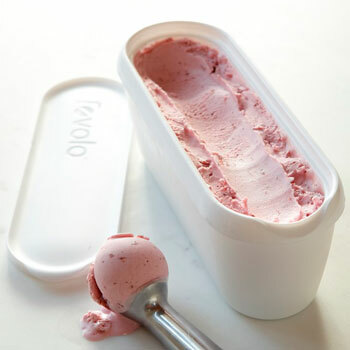 When freezing and storing your ice cream make sure the container promotes fast freezing. The ideal container would have a high surface area to volume ratio. It’s a good idea to store it in the colder area of your freezer, usually the bottom of the freezer. Instead of storing a lot of ice cream in a large container, fraction it into smaller ones to speed up the freezing. If you have a fast freeze button, use it. A good tip is not to open the freezer door and don’t place several unfrozen food items at once. Also, use an airtight container to prevent freeze burn which desiccates and crystallizes the surface of the ice cream as well as prevents odor absorption from other food items in the freezer. Consume homemade ice cream within a week or two. Adding stabilizers helps prolong life and make it more resistant to freeze-thaw cycles. Even if you are storing the ice cream in a sealed container, cover the surface with cling film without leaving any air pockets. This will prevent ice crystals from forming on the surface of the ice cream. When storing ice cream in the freezer, it will eventually become coarse and grainy with large ice crystals and it won't be as smooth and creamy as it once was. You can reduce this effect and extend the life of the ice cream by keeping the door of the freezer closed as much as possible and by not placing multiple unfrozen items in the freezer at one time. Every time you do this, the temperature drops and some of the tiny ice crystals in the smooth ice cream melt and re-freeze into larger ice crystals. Ice cream stabilizers make the ice cream more resistant to freeze-thaw cycles and also help reduce this problem. The perfect scooping temperature is -18 °C to - 13 °C (0-8 °F), a little bit lower than the ideal temperature to be consumed of -12 °C to - 10 °C (14 - 10 °F). The temperature in freezers is about -23 to -28 °C (-10 to -20 °F) so you need to let it warm up a little at room temperature or in the fridge.